Update 5/30/18, 2:15 PM: Today Alderman Hopkins provided documentation that indicates that he asked the 14th Police District to hold a targeted enforcement event on January 19, 2017, to ticket motorists for dangerous driving, but the police took it upon themselves to focus on ticketing bicyclists instead. Read the full story, including the correspondence from Hopkins, on this Twitter thread. 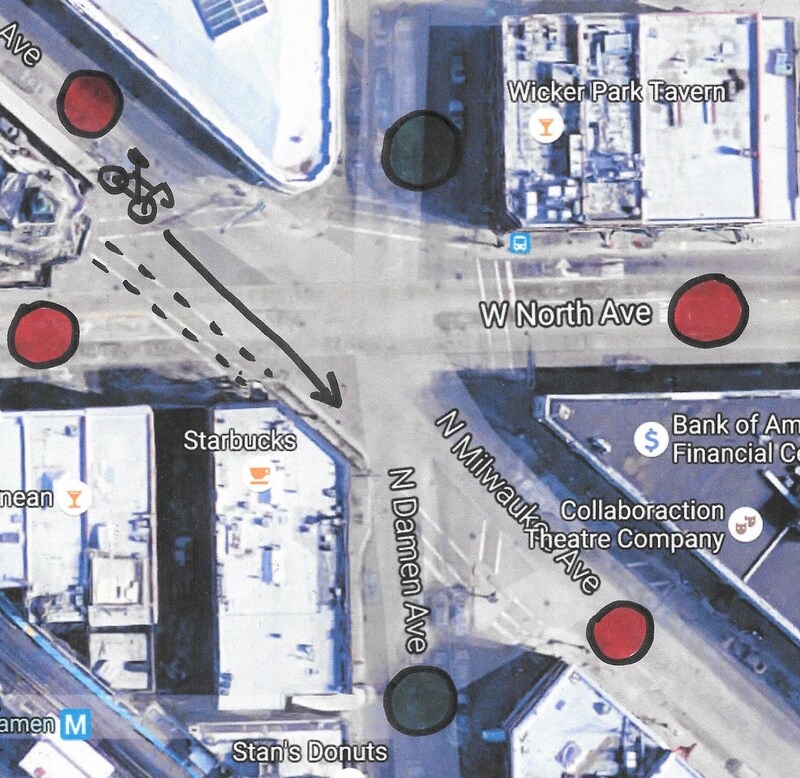 Back in November we heard about a pair of cyclists getting ticketed by the police for a technically illegal, but perfectly safe and very common, maneuver at Wicker Park’s North/Damen/Milwaukee intersection. After heading southeast on Milwaukee, the bike riders crossed North Avenue in the west leg of the intersection while pedestrians in the nearby crosswalk, which parallels Milwaukee, had a walk signal, but traffic on Milwaukee had a red. After crossing North this way, southeast-bound cyclists typically wait in front of a Starbucks, holdings onto the nearby guard rail or placing a foot on the curb, until the next signal phase, when Milwaukee gets a green light. Doing this means you have a shorter distance to travel across the intersection once you have the green. See the map below for a visualization of this move. This morning the Chicago Police Department did a full crackdown on this harmless behavior, and possibly other minor infractions by cyclists. According to the police, this was a targeted enforcement event that included ticketing drivers as well. But while I’ve heard multiple reports of bike riders getting pulled over and cited, I’ve seen no evidence of any motorists being ticketed. Obviously, lawbreaking by people driving high-speed, multi-ton vehicles is much more dangerous than infractions by cyclists. After I learned about the ticketing sting through various channels I contacted Police News Affairs. “14th District officers were conducting a traffic mission in that area this morning, which included bicycle enforcement,” a spokesperson responded via email. However, in response to an inquiry I posted on Facebook, Chris Morales said he was at the intersection this morning and saw drivers obstructing traffic and failing to yield to pedestrians while turning without being ticketed. It’s common for southeast-bound cyclists on Milwaukee to cross with the nearby walk signal and wait by the Starbucks for a green light. Cyclist Chris Bushell was ticketed for doing aforementioned crossing of North Avenue with the walk signal but while traffic on Milwaukee had a red. He conceded that he had violated the law and therefore deserved a ticket. However, Bushell added, “I can’t believe that in this time and place the CPD would dedicate six to eight officers and squad cars to writing administrative tickets to bikers.” He was also annoyed that the ticket for running a red, which carries a fine of $50 to $200, cannot be contested or paid online or at a payment office, which means everyone who got one will have to show up for a court date. According to a DNAinfo report, a man who was ticketed for running a red at the intersection which biking downtown on Milwaukee at around 8:15 a.m. said four other cyclists were ticketed at the time. He said he had just crossed to the Strarbucks with the walk signal when he was stopped by police. Pedestrian Darlene Allison told DNA she saw at least three other southeast-bound cyclists on Milwaukee getting pulled over after running the red. Bushell added that he found it hard to believe that “anyone with half a brain would think this will make either pedestrians or cyclists safer.” He noted that three of last year’s six Chicago bike deaths were caused by drivers who failed to yield while making a right turn. Two of the fatalities occurred within a short bike ride of North/Damen/Milwaukee. “Where are the stings to keep cyclists safe from that?” he asked. Granted, in a month when the U.S. Department of Justice released a report that found evidence of widespread abuses by the CPD, an incident in which a bunch of officers wrote tickets to cyclists who were breaking the law, albeit in a harmless way, is a pretty trivial issue. Still, it would be great to see targeted traffic enforcement used to reduce behavior that is actually dangerous — such as failure to yield, red light running, and speeding by drivers — instead of serving as a waste of time for everybody involved. Did you appreciate this post? Donate to Streetsblog Chicago to help us keep the site running. I’m always an attentive driver, try taking responsibility for your cycling behavior. You too are subject to the exact same rules of the road as I am. And by the way, I ride a bicycle five days a week from Bridgeport to the south loop for my job, I know the rules. I too am both a driver and a cyclist and I cycle five times a day in NYC traffic and drive three or more times a week in the very same traffic. As a driver I know the rules and as a cyclist I know the rules. As a driver I follow the rules first to protect other drivers, because believe it or not the driving rules we all follow are designed first and foremost to protect other drivers from killing one another. Then, the rules are designed to protect pedestrians on foot, houses and buildings, telephone poles, light posts and fire hydrants from drivers. Cyclists are expected to FOLLOW THOSE RULES and if they do they are on EQUAL FOOTING WITH DRIVERS. The enforcement and judicial system in place in most jurisdictions treat both equally. Here is the problem. Putting drivers and cyclists on the same playing field creates devastating outcomes for cyclists. Cyclists generally NEVER exceed the speed limit as posted in NYC, drivers nearly always do and some profoundly so. If a cyclist irresponsibly runs a red light the cyclist generally endangers himself (he is aware of this expensive outcome), if a cyclist sits at a red light and the intersection is clear to proceed and he doesn’t proceed the opportunity cost of not proceeding can also place him in danger as he must continue to engage in traffic that he might otherwise have gained some distance on. You should know this from experience. Drivers run red lights in NYC ALL DAY long and with deadly consequences. Cyclists generally know what is going on when they make left hand or right hand turns. Drivers, however, are often surprised by the invention of the side and rear view mirror and often do no know how to or ever use them. So in closing, enforcement needs to focus on drivers, in a manner that makes them understand they are not on the same nor should they expect to be placed on the same level as cyclists. Then they would pay attention to their driving, use their rear view and side view mirrors, not speed and stop at red lights. And most importantly look out for cyclists. Again you might consider speaking with a more attentive driver and cyclist about this and try to pick up a few tips and pointers. Good luck. Alderman Hopkins probably meant well, but how about a moratorium on ticketing stings that fine cyclists for harmless infractions while ignoring truly reckless behavior by drivers?